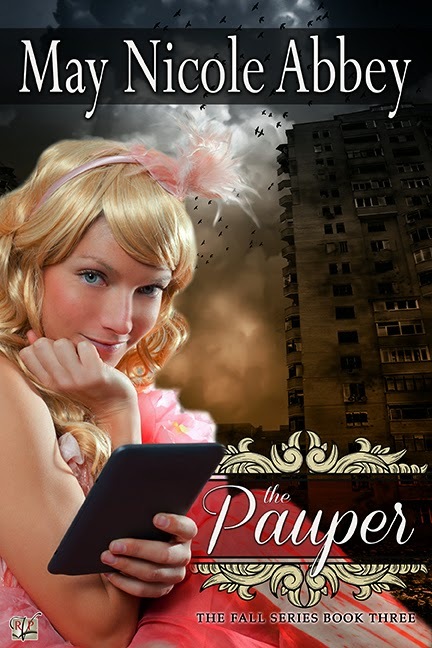 Welcome to my tour review stop for The Pauper by May Nicole Abbey! You can read an excerpt from the last tour here. I really enjoyed the last book in this series that I read last year, The Scholar. This third book, The Pauper, felt quite different to me than that one because I felt the characters were so different and, thus, their voices were as well. It was interesting to feel those changes. The story turned out to be a very enjoyable, clean read, and one that I would recommend. I do have to say that the beginning was a little rough for me. Heather is overly dramatic and I didn't necessarily like her as a character, which made it tough to get invested initially in the story. I did like Ammon marginally more, but he is mostly an enigma for some time. What pulled me on was my curiosity to find where the story was headed and why certain characters were so important. I was also curious to see how a romance would come about between the two main characters. There was definitely not a case of insta-love in this story, which I appreciated. There was something else instead. Almost a passion of difference. That totally doesn't make sense, but they are both very strong characters and feel somewhat strongly about each other, but not romantically, at first. So, I was just going along for the ride until about half-way through the book when things blow up between the two characters and they are both changed. Their circumstances become something else entirely different as do the way they see themselves and each other. This is where the story really picked up for me and I became very engaged. I think some of it also had to do with the characters themselves changing and evolving into individuals that I liked more. Not that they become perfect or don't still make mistakes, because they definitely do, but they become more conscientious about who they are and who they want to be. They also have quite an intense adventure, becoming much closer and developing a friendship that has the possibility of something more. And I needed him. Not just for comfort or for care, but because without him I was lost, frightened, suffering, and incomplete. I needed my solid, steady companion as much as I needed each measured, steady beat of my heart. Later, when I woke up and became conscious of my own need, it filled me with fear and a sort of dread. What had happened to me? And what was in store when we would try to separate? Once as a child I opened a book and found two pages stuck together. They had gotten wet and dried as one, as though they had been glued, becoming a part of each other. When I tried to pry them apart, I tore them in half and so destroyed them both. The different languages, peoples, and lands visited were interesting as well. I can't say that everything was always authentic or realistic (this is a time-traveling story), but it still worked and was very entertaining. I do want to note that I don't think the cover quite matches the story. I would have liked to have seen a background from London in the 1700's and the cover model either dressed in that era or in what would be considered present day attire. In the end, The Pauper left me content and happy with a sweet romance, some adventure, and some poignant moments to reflect on. I would recommend this for those readers who enjoy sweet tales of time-travel and adventure. May Nicole Abbey is actually Caroline Gregory and Shawnette Nielson, sisters on a mission. Their goal is to write clean, adventuresome romance stories, full of lovely characters, personal growth, truth, and hope. Although they live nearly a thousand miles from each other, and are both busy with the daily needs of their respective families, they carve out time each night to put fingers to keyboard and write. Their goal? Twenty completed books. Set all over the world and throughout time, they thrill at the freedom that writing time travel offers them. From Georgian society, to Ancient Egypt, and plans for a western, contemporary, and even a book set in ancient Greece, the possibilities are limitless. Such a good deal on her books! Your new books are gorgeous! I am interested to see what you think of A Woman of Fortune. I have been debating getting that one. The Hatmaker's Heart has a super cute cover! Lol! They are pretty. Thanks, Kimba! Lol! I'm not that special. Well, I mean I am, but we all are in our own ways. :) And really, I do too much sometimes.